We offer NHS orthodontic treatment to children who meet specific criteria and require correction of their teeth for dental health reasons. If you think your child could benefit from orthodontic treatment, they will first need to be assessed by their general dentist, who will then refer you to our in-house Orthodontist if necessary. Dr Avani Patel (Specialist Orthodontist) will then carry out a thorough assessment of your child's teeth and jaws to ascertain if they qualify for NHS funded treatment. NHS patients are assessed in relation to the Index of Orthodontic Treatment Needs (IOTN) and must score 3.6 and above to qualify for NHS funded treatment. If your child qualifies for treatment, they are placed on a waiting list. This is due to a limited amount of NHS funding each year, resulting in a waiting period of 18-24 months. Once at the top of the treatment waiting list, we will contact you to attend for treatment planning where we will take up to date x-rays, photographs and digital study models of your teeth. It is essential that your oral hygiene is of an excellent standard in order to proceed with treatment. 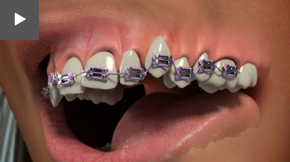 Once your treatment has been planned, appointments will be made for the fit of your braces. Thereafter the adjustment appointments will be every 6 to 8 weeks. The total treatment time is variable, but is approximately 18 -24 months. For patients under the age of 18 who do not meet the NHS orthodontic criteria or those who are on a long waiting list, we offer a scheme called 'Child and Teen'. WHAT ARE THE BENEFITS OF 'CHILD AND TEEN'? No waiting list. Our NHS waiting list is almost two years long. Taking this option means your child no longer has to wait and can access treatment immediately. Treatment is carried out by Dr Avani Patel who is an experienced specialist orthodontist. As with NHS care, this treatment uses traditional metal wire braces, but one can choose tooth coloured appliances at an additional cost. The scheme covers orthodontic treatment needed to straighten the teeth,including follow up and emergency appointments, retainers at the end of treatment and a retainer check after 6 months. This does not cover functional braces. Any additional treatment - will incur a cost which will be discussed at your inital consultation. Under the Child and Teen scheme, we have a discounted treatment option of £1500 available (usual cost is £2500) for children and an affordable, interest free payment plan to help spread the cost. For more information on Under 18's please call us on 0208 478 1050 or send us your enquiry online.